Lindéngruppen has signed a long-term agreement to support the Blekinge Institute of Technology’s (BTH) internationally recognised research on strategic sustainable development. The company will provide €1.6 million of funding over five years to help BTH develop and expand its groundbreaking research in the field of strategic sustainable development. BTH is a leader in developing methods to help companies, municipalities and other organisations that want to work strategically with sustainable development and contribute to society's transition to sustainability. Lindéngruppen is committed to active and responsible ownership of industrial enterprises. Its founder, Ulf Lindén, helped to establish BTH in 1989 and was a staunch supporter of higher education and research. Lindéngruppen itself uses a foundational method for strategic sustainable development mentored by researchers at BTH. Jenny Lindén Urnes, Lindéngruppen owner and chairman, said the funding agreement was a natural extension of that connection. "It is natural for us to have a closer relationship with BTH as part of our intensified engagement in society's transition to sustainability. These issues are among the most important of our time, and I look forward to long-term collaboration with BTH in this field," she said. 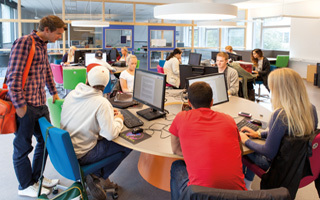 BTH is a Swedish and international leader in research and education on sustainable development. Its staff includes professor Karl-Henrik Robèrt, founder of The Natural Step, a non-profit organisation that has been a front-runner in strategic sustainable development for more than 25 years. BTH and The Natural Step operate the StepWise network for companies – including Lindéngruppen – which is a forum for exchanging and developing best practices on sustainability. Göran Broman, professor and head of the strategic sustainable development department at BTH, said the funding from Lindéngruppen was recognition of the quality of BTH's research in this field. "This gives us an opportunity to make even more of our research and provide benefits not just for Lindéngruppen but for business and society as a whole."